With the ability to produce instant Power and Torque Graphs, we can evaluate any modifications carried out. You'll be surprised at the extra horse power. 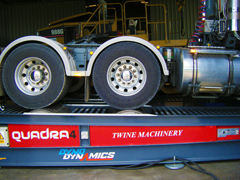 Twine Machinery has taken delivery of a "state-of-the-art" chassis dynamometer. vehicles to be tested under load in the workshop. 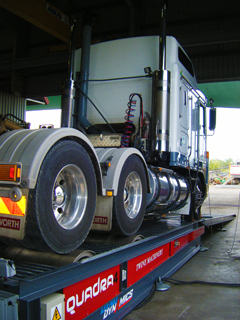 Vehicles can be fitted and ready to run in just a few minutes. Verifies engine power output, speedo accuracy and engine In-Frame rebuilds can be run - in and tested with ease. 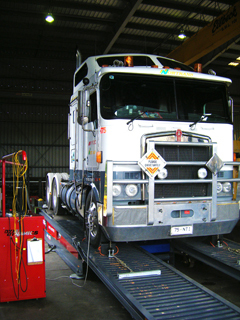 A "Road Load" feature allows the operator to simulate the GCM of the vehicle up to 150 Tonne, enabling easier diagnosis of cooling system and power loss problems etc. DT80 Emission testing, which in the near future will be an on-highway running requirement. Instant and repeatedly accurate power curves can be carried out, making it easy to spot any small increase / decrease in power. 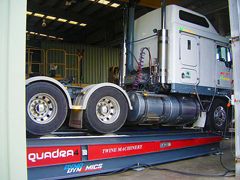 The Quadra 4 is a mobile unit and can be transported to site if required. Phone: 07 4774 6477 .. Fax: 07 4774 6837 ..